As usual the train station is in the lower part of town but there are buses which run frequently and will take you to the upper part of Bergamo for the cost of one euro. The 1A bus can be boarded just outside the train station and there are plenty of young friendly locals who are happy to give you directions. Once in the Bergamo Alta it is easy to wander around and discover the sights in this historic town. Of course most of the streets are inclined, so this is yet another opportunity for your daily workout, no gym required. This will help lessen any guilt from having that tempting gelato later in the day. La Rocca is a 14th century fortress high on a hill which offers the most breathtaking panoramic views of the entire area. Surrounding La Rocca is a park which is a welcome respite from the uphill walking. Local residents can be seen sitting in the shade relaxing, having a picnic or reading a book. 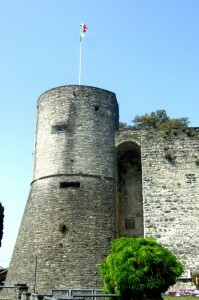 Inside La Rocca is a museum which is open to the public. At one time this former Roman military camp had been a prison and also a barracks and executions took place in the park which is appropriately named Parco delle Rimembranze (Park of Remembrance). Piazza Vecchio is the heart of the old town on Upper Bergamo, and in the center of this piazza a fountain which was presented to the city in the 18th century. This piazza is the home of Palazzo Nuovo, the 14th century Palazzo Podestà and the Palazzo della Ragione with its 12th century bell tower, Torre Civica and Torre Campanone. The tower is 174 feet high and you can take an elevator or climb the 230 steps to the top for commanding views of the city and the distant Alps. It is especially beautiful late in the day or at sunset. Every night the bells toll 180 times at 10pm, dating back to the ancient times when the city gates closed at that time, and the bells rang as a warning to its citizens. 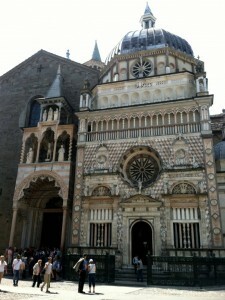 The most famous church is Upper Bergamo is the Basilica di Santa Maria Maggiore in Piazza del Duomo. This 12th century church has a reputation for being one of the most important buildings in this entire region. Stepping inside leaves you with a respect for the medieval art as you take in the tapestries, frescoes, paintings and sculptures. The exterior is equally impressive with sculptures of lions and intricate carvings on columns and exterior walls. 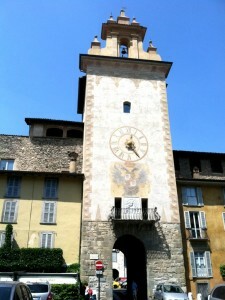 A day trip to Bergamo may not seem like enough but then there is always a reason to return. Almost another full day in London before my evening flight back to New York, and not wanting to waste a day, I decided a day adventure was needed. 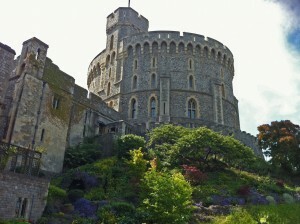 Today I thought, why not head out early to the city of Windsor and Windsor Castle. A quick check on the Internet showed many tours available from London, bus routes available and the train. For this day trip I opted for the train. So once again with Oyster card in hand, it’s the only way to get around on London’s underground if you are going to be spending anytime in London. Jumped on the Circle Line from Gloucester Station with a quick transfer at Embankment Station to the Bakerloo Line and one stop later brought me to Waterloo Train Station. Waterloo Train Station to Windsor would be on South West Train, I purchased a round trip anytime ticket for 15.80 pounds because of the time I was going, an off peak round trip between Waterloo and Windsor could be bought for 10 pounds if your time is more flexible. One of things I like about these day adventures in London is the different architecture you get to see around the city. This day as I was moving along the train I was admiring the steel and glass roof of Waterloo Train Station overhead when I heard the train doors close, looking at the train, I saw the conductor waving and smiling as the train pulled out of the station with me still standing on the platform. I think the conductor liked that, not a problem, trains leave every 30 minutes so I had more time to enjoy the architecture of Waterloo Station. Travel time between Waterloo Train Station and Windsor was a quick hour. Arriving at the Windsor Eaton Station in Windsor I decided to head straight to Windsor Castle, since my goal on setting out on this day adventure was to see the castle, I might as well head there first. As you walk through the town of Windsor coming from the train station you cannot miss the castle rising on the hill to your left. A very impressive sight to see, I made my way along the base of the castle and following the hordes of people, yeah I said “hordes” since Windsor Castle is one of the most popular tourist destination when visiting London, one would expect to see a lot of tourist. Rounding the corner towards the entrance I did not expect to see the line of people that made its way down the side of the castle walls waiting to be admitted into Windsor Castle. Today there had to be at a least a couple hundred people waiting in line. OK, maybe I won’t be going inside the castle today I thought. I proceeded to walk along the line of people and headed to the back of the castle to Windsor Great Park. Windsor Great Park, a fantastic setting, large green grass that stretches forever and a forest just sloping away from Windsor Castle, I figured this could be a great place to spend some time just walking around. 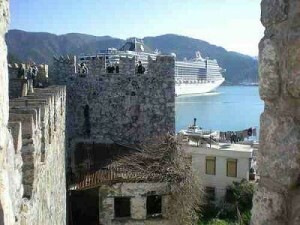 Yet reminding myself that the goal for today was to see the castle, I started back towards the entrance. The line of people was still there. Upon reaching the front of the line, I overheard someone say “that this line was for tour groups, if you are on your own you could precede straight in”. Fantastic, no wait in line, I was in the castle in a matter of minutes after paying my Adult £9.00 admission, Children were £8.00. Now I am not going to bore you with a blow by blow description of Windsor Castle, what I will say is that on your next visit to London it would be well worth the trip to see this magnificent castle and to admire the history that can be found here. In all I spent a little over 2 hours enjoying all that Windsor Castle had to offer. It’s that time again to take a few days off and find a place to relax. Once again with as much time spent traveling around it is always nice to head somewhere to relax and just “veg out“. So once again, I am headed to Costa Rica. When we tell friends that we have some time off and that we are headed to Costa Rica; the first question always asked is were are you headed to? Are you going Zipling, white water rafting, or to see the volcanoes? While Costa Rica has all this and much more to offer, we always get a strange look when I answer, we are going to Manuel Antonio to sit on the beach and just relax. 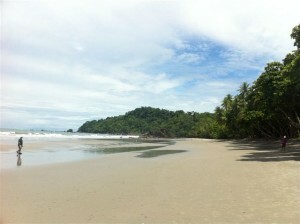 But, how can you go all the way to Costa Rica and just sit on the beach. I mean there is so much to do. Well after spending about 20 family trips traveling the majority of the country and me personally flying at least 100 trips over the years to San Jose and Liberia, I am ready to relax and enjoy the beach. 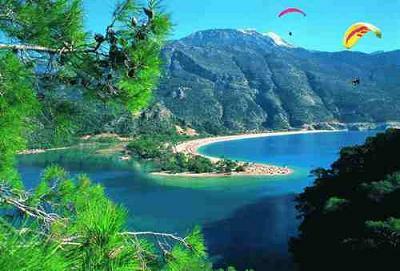 Next question always asked is how long you going to stay, our answer is always different, this time we are planning 9 days on the beach. You are going to spend 9 days on the beach and do nothing but relax. Well yeah, sort of, I mean we will do things, it’s just that no plans have been made. We’ll take one day at a time and see how the spirit moves us each day. Lets just keep it simple, wake up in the morning, walk out of the room to the waters edge, stand there for about 10 minutes soaking in the beauty of Manuel Antonio, then let the spirits guide us, are we going to walk right along the beach or are we going left this morning and see what the tide brought in last night? A nice walk usually will lead to a great breakfast overlooking the Pacific, maybe another walk on the beach or soak up a couple hours of sun, for me a couple hours in the shade of a palm tree just reading and enjoying the sound of the waves breaking on shore. 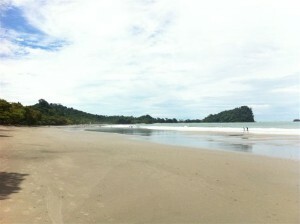 Afternoons will usually finding us walking into the town of Manuel Antonio, for this the decision will have to be left on the beach, I mean the spirits told us if you want Gelato you must go left. Evenings are often spent sharing a drink with a new found friend and watching the sun get swallowed by the Pacific, thus ending another day in paradise. Except you need to finish the night with a enjoyable dinner admiring the lights strewn throughout the hills of Manuel Antonio. All in all a relaxing day in Costa Rica, no plans, just go with the flow and see where the day takes us, then do it again for the next 9 days. Give it a try, it might just work for you.